Few visitors to Charlotte Amalie go beyond its main street Donnigens Gade. That is where all of the popular jewelry stores and other boutiques are centered. While the main street is usually teaming with people when the cruise ships are in port, the streets in back of the shopping district going up the hill are almost desserted. Most of the buidlings are not in good condition and what sidewalks there are disappear unexpectedly at points. Still, if you walk these streets, you do find some architecturally interesting buildings dating from the Danish colonial period. 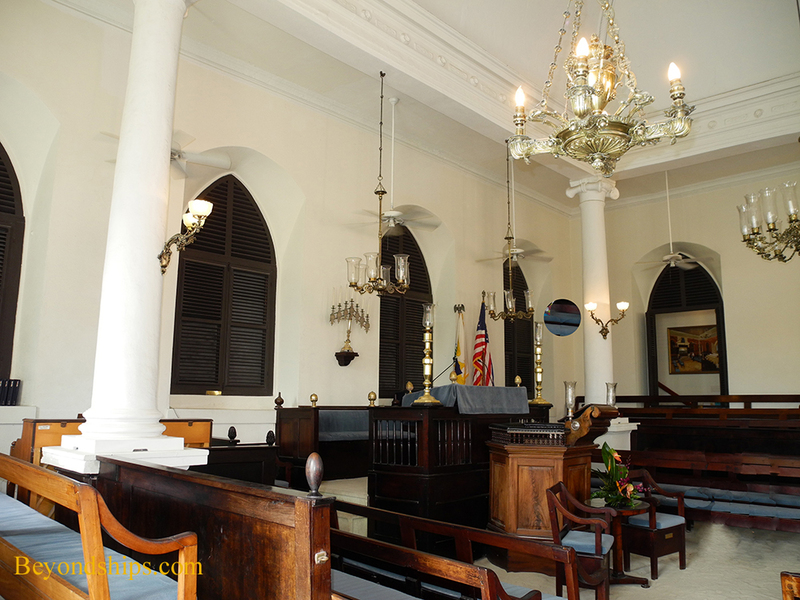 There is also the classical style Reformed Protestant Dutch Church of St. Thomas. The plaque above the door tells you that the original house of worship burnt down in 1804 and was re-built in 1844. Yet, the church is not the oldest house of worship in the vicinity. A few streets away, up a rather steep hill, I came across a building with a modest plaque outside informing the reader that it was a National Historic Landmark. 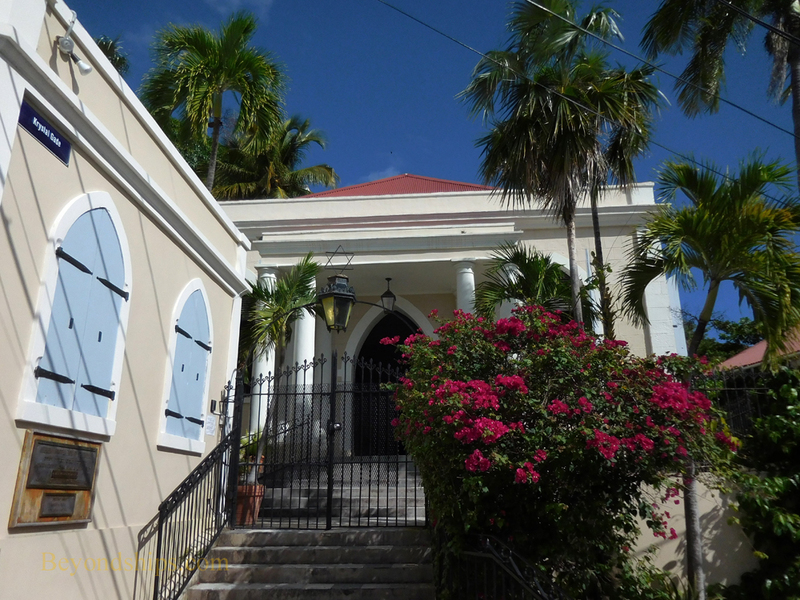 This was the St. Thomas Synagogue of the Hebrew Congreation of St. Thomas built in 1833. 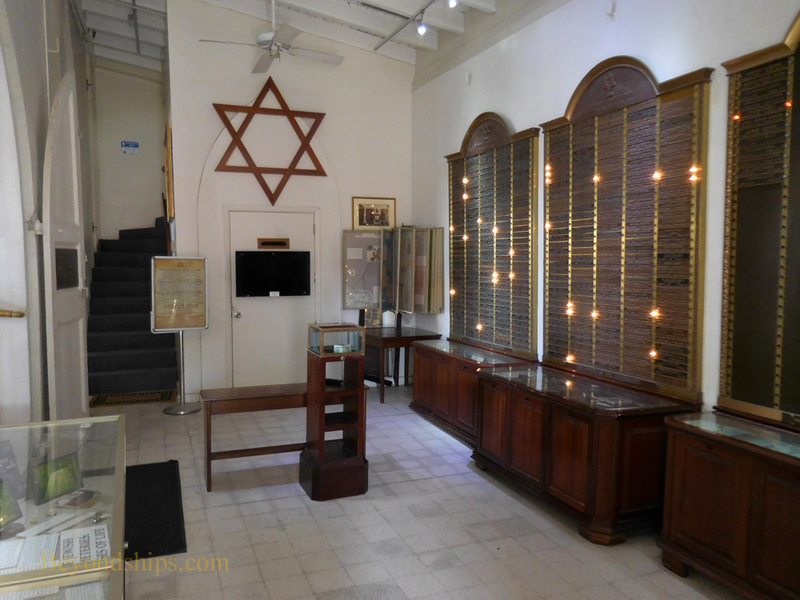 It is the second oldest synagogue in the Western Hemisphere and oldest in continuous use under the American flag. Through the iron gate, I could see the front steps of the building and with the branches of a flowering tree draped over the wall that separated the building from the street, it reminded me of the Mediterranean. As I was preparing to take a photo, I heard a disembodied voice calling me. This was rather startling as no one else was in sight. However, I quickly realized that the voice was coming from inside the building. Accepting the invitation to come in, I passed through the electrically-operated front gate, walked up the steps and into the dimly lit synagogue. It was there that I met Judith, a docent, who delighted in talking about the building and its congregation. She suggested that I sit down on one of the dark wood benches on the side of the room nearest the door. Like all the furniture in this room, these benches were made of maghogany grown in St. Thomas but sent to Barbados to be crafted. They were not oranate but beautiful in their simplicity. Judith sat on the benches on the opposite side of the room across the open space of the center. Coincidentally, this mirroed the arrangement when the synagogue was new - - men on one side, women on the other. Now a reformed synagogue, such separation of the sexes no longer takes place. 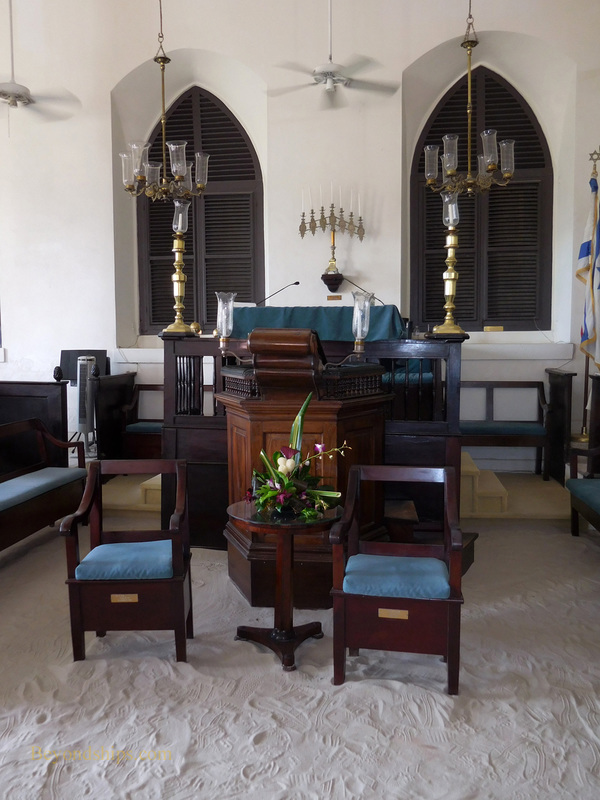 Jews first settled in the Virgin Islands in 1655, when the islands were ruled by Denmark. However, they did not form a congreation in St. Thomas until 1796. A few years later, the congreation built its first synagogue. The congreation was, however, plagued by fires. The first synagogue burnt down in 1804. Partially rebuilt, the synagogue burnt down again in 1806. The congregation then used a building on the current site for 10 years before deciding to built a new larger synagogue. In 1831, the new building too burnt down. Two years later, the current building was dedicated. 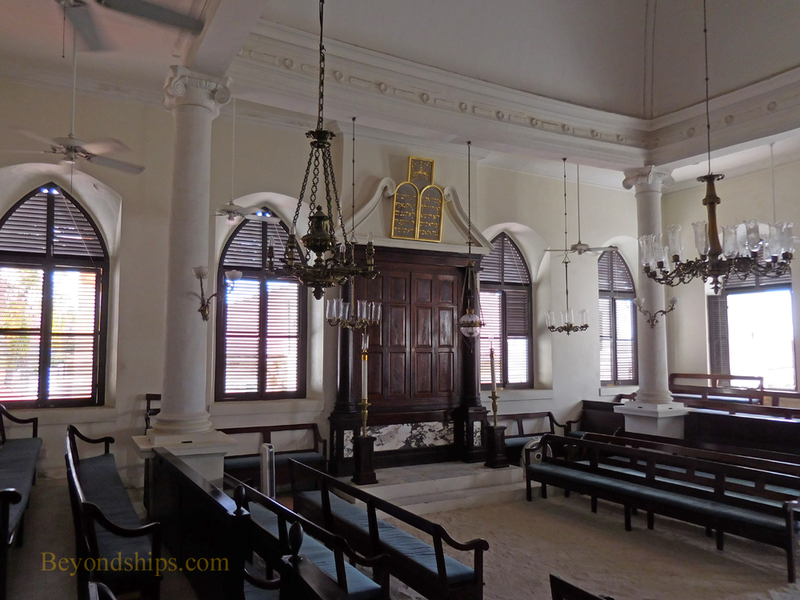 At the time, the congreation was Sephardic Orthadox and so the building reflects Sephardic architectural concepts. The proportions of the main room are mathematically perfect. In addition, the walls are aligned to the points of the compass. As noted earlier, there is an Iberian feel to the building. The floor of the synagogue is covered in white sand. Some say that this is meant to signify the sands of the Sinai, which Moses and the Israelites wandered for 40 years. However, the more accepted explanation is that it is a homage to the Jews who continued to practice their faith during the Spanish Inquisition. Since to do this was punishable by death, they met in cellars and spread sand on the floor to muffle the sound of their prayers. 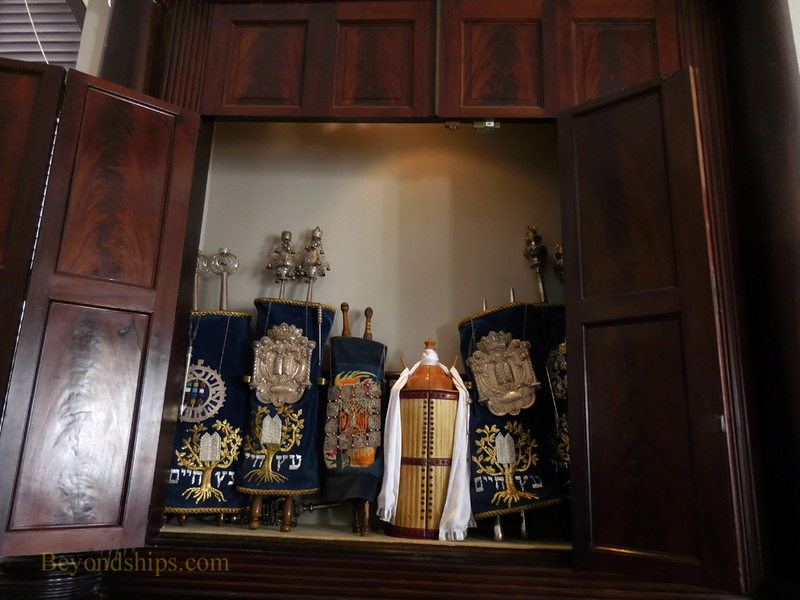 Judith showed me that inside the large cabinet on the wall opposite the pulpit were the synagogue's Torah scrolls. They were wrapped in a grogeous blue fabric with Hebrew lettering. Antiques, she noted that one of them had been rescued from the Holocost. Beyond the main room was anoher room containing the synagogue's archives. A number of display cases around the room were filled with exhibits relating to the history of the congregation. One had a series of notices about the marriage of the artist Camille Pissaro's parents. The St. Thomas Synagogue is open to all. As a non-Jew, I did not understand the full significance of everything that Judith told me. However, I was impressed by the spirituality, architecture and history of this place.